Product categories of Zigzag Sewing Machine, we are specialized manufacturers from China, Zigzag Sewing Machines, Heavy Duty Zigzag Sewing Machines suppliers/factory, wholesale high-quality products of Top and Bottom Feed Zigzag Sewing Machine R & D and manufacturing, we have the perfect after-sales service and technical support. Look forward to your cooperation! FOXSEW Zigzag Sewing Machines also have the biggest advantage on PRICES ! It covers full range of Heavy Duty Zigzag Sewing Machines, most of machines are Top and Bottom feed Heavy duty Zigzag Sewing Machines, like Long Arm Heavy Duty Machine, Cylinder Bed Unison Feed Zigzag Sewing Machine, Flat bed Top and Bottom Feed Heavy Duty Zigzag Sewing Machine, Post Bed Zigzag Sewing Machines. 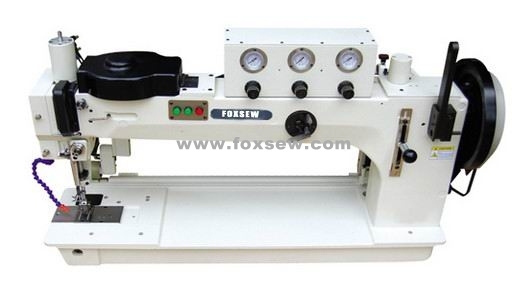 Automatic Oil-Lubrication Zigzag Sewing machine prove that FOXSEW has the strong ability on invention. To be honesty, in China very few factories can make this model with good quality. So, FOXSEW has his advantage in the Zigzag Sewing Machine Series. Direct-drive Zigzag Sewing Machine also need high-technology, otherwise, you can not do it well, but we did ! The Long Arm Heavy Duty Zigzag Sewing Machine for Sail Making is very popular with American and European Customers, and we have other Sail making Zigzag sewing machines, Like FX-366-76, FX-2153BL30, FX-2153, All these Zigzag sewing Machines can be used for sewing Sails, Spinnakers, Wet suits, Diving suits, Awnings. Oil-Lubrication Zigzag sewing machine is popular in the American Market, like Ecuador, Boliva, Colombia, Brazil, etc- Actually, not only in the American market, but also in the world market, like Bulgaria, Ukraine, Lithuania, Italy, Portugal, Spain etc- FOXSEW Zigzag Sewing machine won the trust of the customers from all over the world !